Sponsor will receive signage at the event, recognition on social media, website & emails. Show your appreciation to your favorite associate members that help you keep you r business prospering. 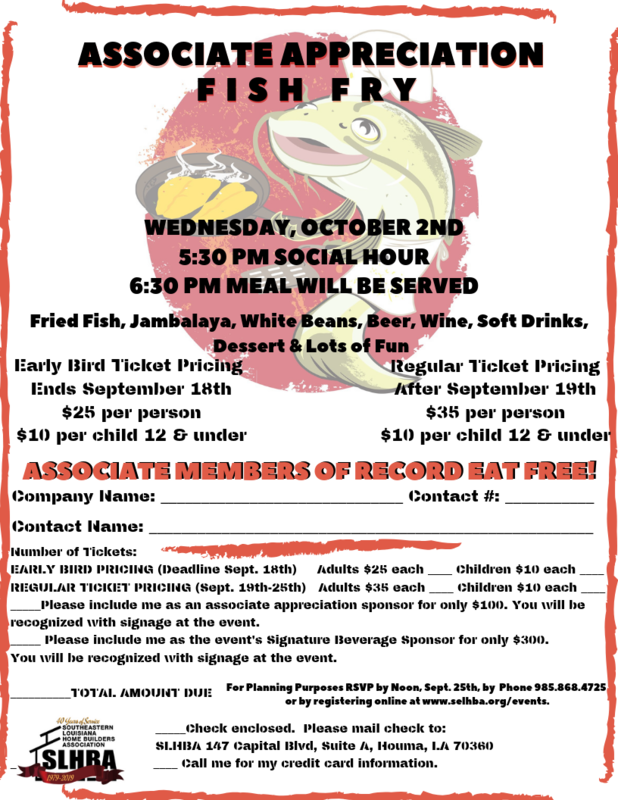 For as little as $100.00, you can become a Associate Appreciation Sponsor for our Fish Fry. This will give you signage on the tables and on our website, emails & social media. In turn this helps cover the cost for the Builders to come to the Crawfish Boil for Free. The Signature Beverage Sponsor is only $300.00. You will have an event sign at the Fish Fry as well as on the tables, our website, emails & social media. Only one of these sponsors are available, so act fast and get your logo on our flyers before we send them out.